Several West Philly Porchfest performances. The first Porchfest was held in Ithaca, NY in 2007. 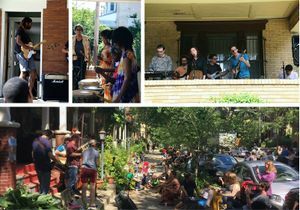 The first annual West Philly Porchfest took place on June 4, 2016 with 75 acts playing shows at over 30 porches. In 2017, the event more than doubled, with over 70 porches hosting more than 150 acts. Note: The above descriptive information came from the event's About page. Porchfest 2018 Is Coming!, West Philly Local, April 3, 2018. This page was last edited on 12 November 2018, at 16:50.